VATICAN CITY Pope Benedict XVI will be known as "pope emeritus" in his retirement and will continue to wear a white cassock, the Vatican announced Tuesday, again fueling concerns about potential conflicts arising from having both a reigning and a retired pope. The Vatican spokesman, the Rev. Federico Lombardi, said Benedict himself had made the decision in consultation with others, settling on "Your Holiness Benedict XVI" and either pope emeritus or Roman pontiff emeritus. Benedict's decision to call himself pope emeritus and to keep wearing white is sure to fan concern voiced privately by some cardinals about the awkward reality of having two popes, both living within the Vatican walls. Adding to the concern is that Benedict's trusted secretary, Monsignor Georg Gaenswein, will be serving both pontiffs  living with Benedict at the monastery inside the Vatican and keeping his day job as prefect of the new pope's household. Lombardi also elaborated on the College of Cardinals meetings that will take place after the papacy becomes vacant  crucial gatherings in which cardinals will discuss the problems facing the church and set a date for the start of the conclave to elect Benedict's successor. The first meeting isn't now expected until Monday, Lombardi said, since the official convocation to cardinals to come to Rome will only go out on Friday  the first day of what's known as the "sede vacante," or the vacancy between papacies. 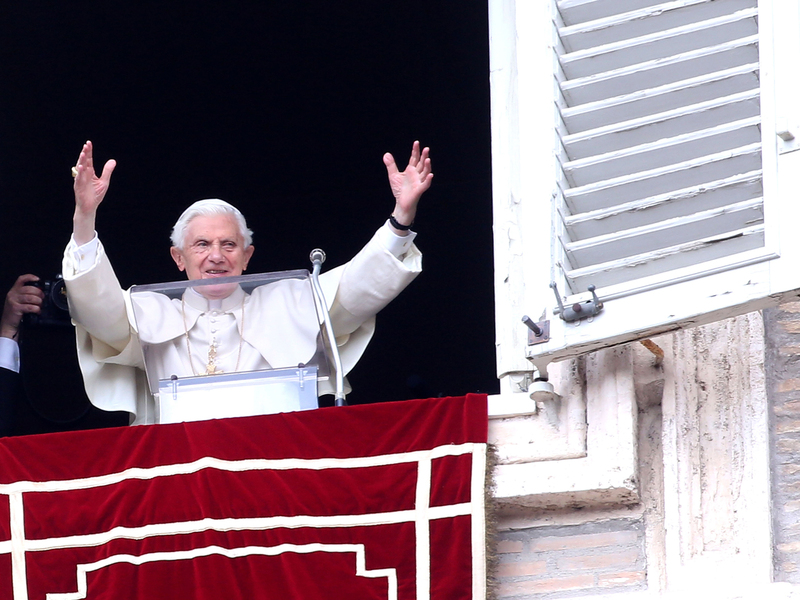 Benedict on Monday gave the cardinals the go-ahead to move up the start date of the conclave  tossing out the traditional 15-day waiting period. But the cardinals won't actually set a date for the conclave until they begin meeting officially Monday. On Wednesday, Benedict will hold his final public general audience in St. Peter's Square  an event that has already seen 50,000 ticket requests. He won't greet visiting prelates or VIPs as he normally does at the end but will greet some visiting leaders  from Slovakia, San Marino, Andorra and his native Bavaria  privately afterwards. On Thursday, the pope meets with his cardinals in the morning and then flies by helicopter at 5 p.m. to Castel Gandolfo, the papal residence south of Rome. He will greet parishioners there from the palazzo's loggia (balcony)  his final public act as pope.